Description Tired of all that black leather? We've got just the thing for you! 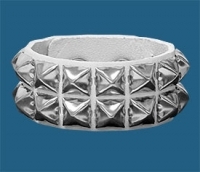 This awesome all white leather wristband has two rows of chrome pyramid studs and double snap closures in the back that adjust to fit wrists 5 1/2" to 7 1/2" in circumference. Handmade in Eugene, Oregon, USA just for us from full-grain leather.